I seem to have made Fridays my “what’s for brunch” posting day. Honesty, I start thinking about weekend brunch on the deck from about Wednesday. 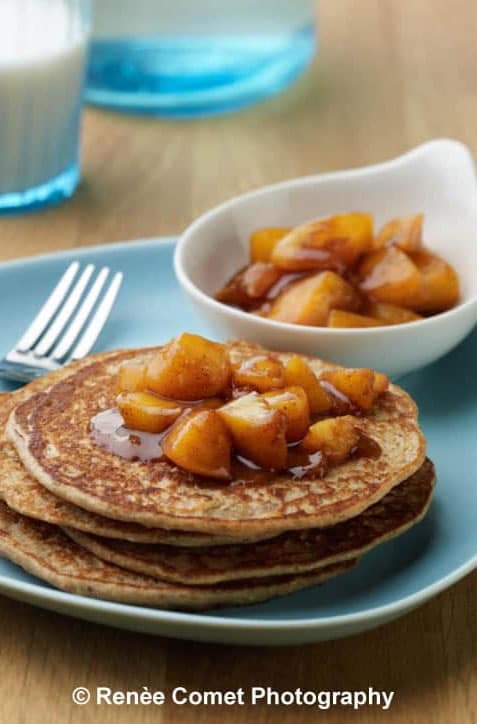 Tomorrow I’m ready to make my Enchanted Vanilla Pancakes with Chai-spiced Peach Compote. I got fresh peaches in my CSA and they are ready to go! These pancakes are enchanted with the nutrition of beans – which should make you rest easy feeding them to your family. They also have whole wheat, oats, and ground flax-seed. Why call them enchanted? It’s magical the way the most determined bean hater will not have a clue that their dreaded enemy is inside these innocent vanilla pancakes. 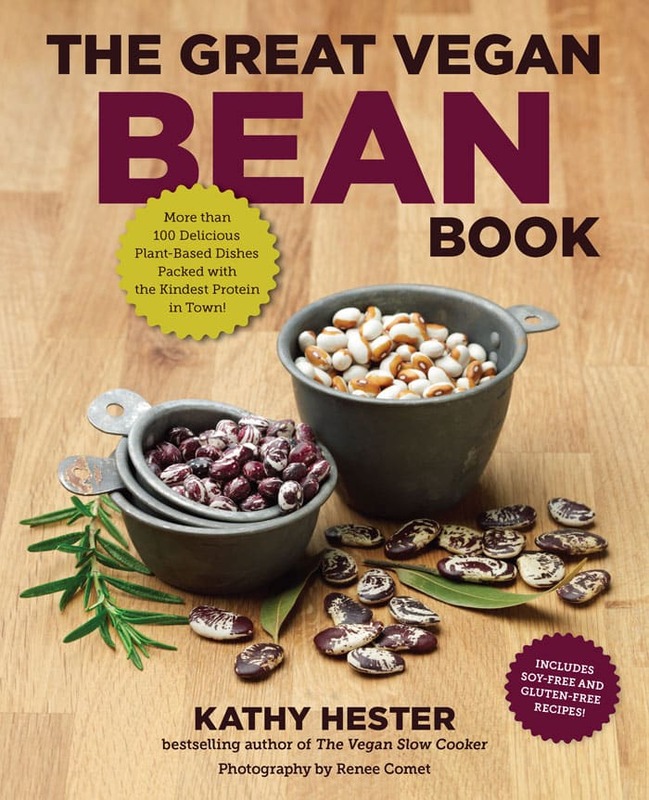 That was part of the fun of writing The Great Vegan Bean Book – I love hiding good-for-you things in food for Cheryl! Top them off with fresh peach compote to make it heavenly. Make a batch or two of the compote while peaches now, while they are in season. It freezes well, that way in the dead of winter you can pull some out to use and cheer yourself up. It works every time for me! To prepare the compote, cut the peaches in half, remove the stone, and remove the peel. If the peaches are ripe enough the skins will peel off easily. Add all of the compote ingredients to a saucepan and bring to a simmer over medium-high heat. Decrease the heat to low, cover, and cook for 15 to 20 minutes, until the fruit is cooked through. Add the wet ingredients to a food processor and purée. Add the purée to the dry ingredients. Mix with a wooden spoon until thoroughly combined. Heat a nonstick skillet over medium heat. You can cook a few pancakes at a time, but make sure not to crowd them in the pan. Cook until you can see a few bubbles on the top and the edges are dry, then flip and cook a few minutes more until the pancake is cooked through. 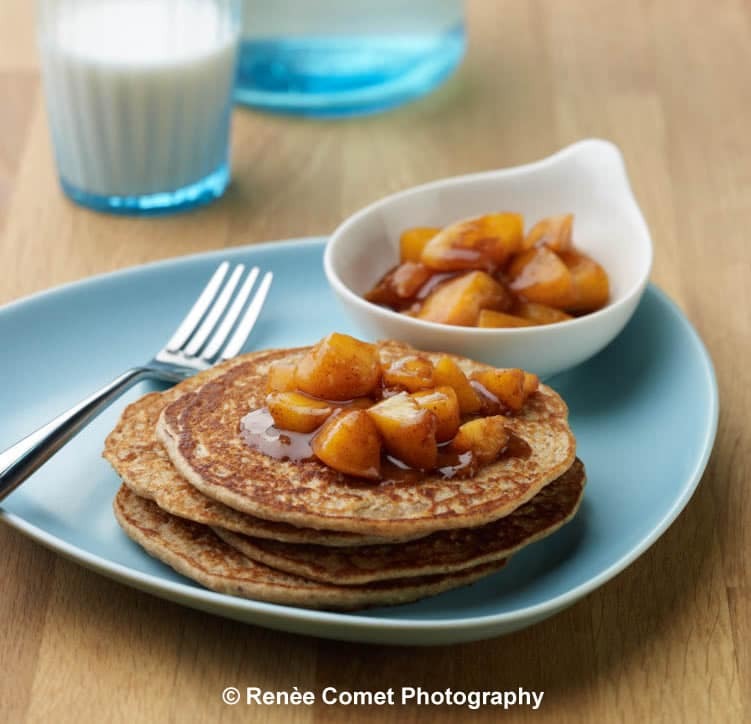 Spoon Peach Compote onto pancakes and serve. That compote sounds so good! I bet it would be yummy on ice cream, too. G’day! 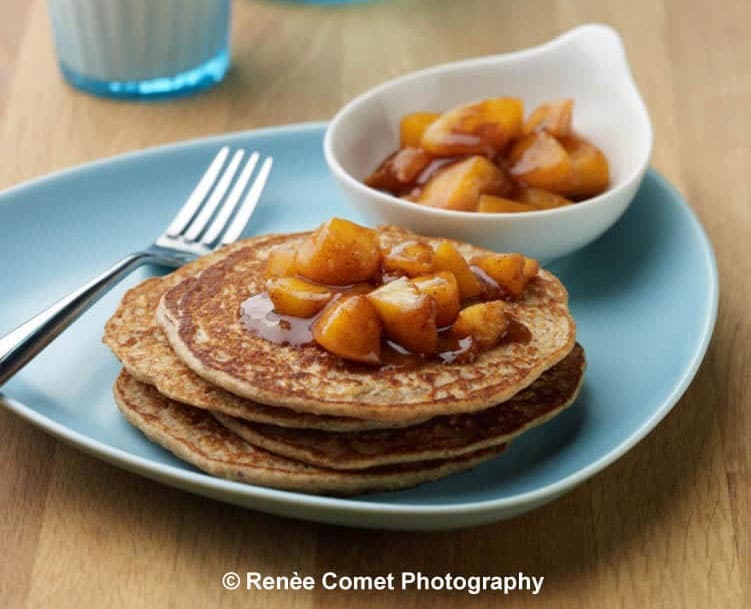 The compote sounds lovely and love the white bean puree re the pancakes! GREAT idea! These were delicious, thanks for creating them! I’ll definitely be making them again. They keep and reheat very novelty, by the way. These pancakes are great! Thank you for all that you do, we own a few of your books! My daughter’s pre-school serves pancakes once a week. We bring our own plant based pancakes, but her gluten free friend brings pink or red pancakes. Do you have any advice on how to make these delicious and healthier pancakes, red without using food- coloring? Maybe I’ll try doing some experiments with using raspberries and reducing some of the wet ingredients.